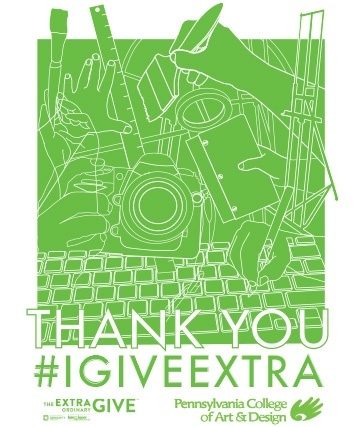 PCA&D has some impressive things planned for the ExtraGive on Friday, November 18th! Once again, PCA&D adjunct instructor Becky Blosser has designed a PCA&D print especially for the ExtraGive! Donate $50 for a limited edition print! Thank you Becky! Our Pop-Up Print Shop, where PCA&D students will be silkscreening a variation of Becky Blosser's poster onto t-shirts, will run from 1 – 2 pm in the mezzanine. Bring your own cotton T- shirt if you prefer v-necks or a specific cut/size. (Please note: the print is black so a light colored shirt will work best!) General sizes are provided for those who donate $50+ (while supplies last). There will be computers in the atrium for people to use to donate along with coffee and donuts (available from 8 – 10 am). Please join us at the Ware Center for the Benchmark Construction giving event from 5 - 8 pm. It’s free and open to the public! The Pop-Up Print Shop will be there and PCA&D Student Council Represenatives Emma Leadem and Brianna Soucheck will be doing caricatures. The 2016 Extraordinary Give is Lancaster County's largest day of giving - is on! 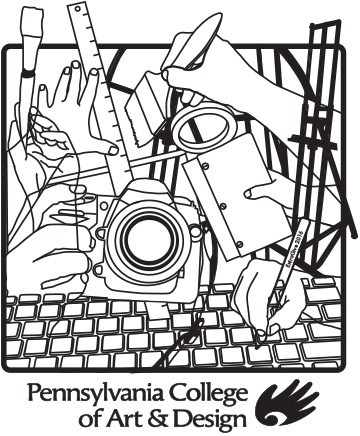 And you can participate by supporting Pensylvania College of Art & Design. On November 18, 2016 donations will be accepted from 12 midnight - 11:59 p.m. as part of Lancaster County's largest day of online giving. On that day, every dollar donated will be stretched by at least $300,000 from the Lancaster County Community Foundation, the event's presenting sponsor Rodgers & Associates, and generous community partners, to support non-profit organizations in our community!